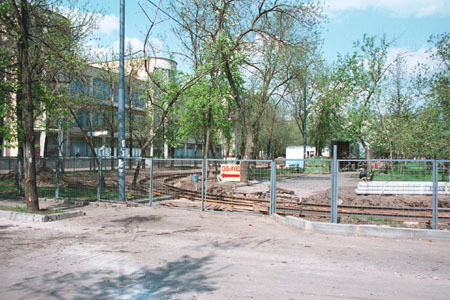 1st Botkinskiy Proyezd loop, being a new terminus for the multiply cut route 23, was rapidly constructed in 1st Botkinskiy Proyezd in April-May 2002. 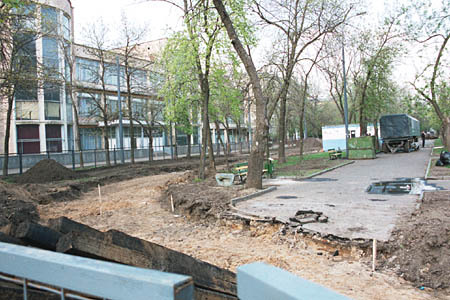 No loop had been planned here before April 2002, when the mass campain lead by the "Muscovites for Tram" group suddenly and almost unexpectedly fruited with a decision to save a part of the line deemed to closure by building a new terminus. 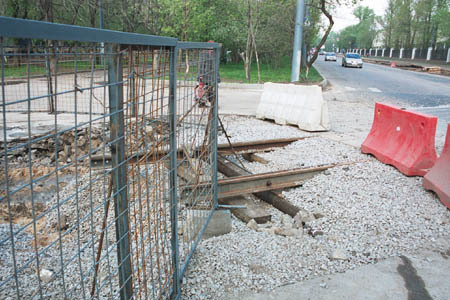 Eventually there have been found necessary funds, and the work has been done on time. This lesson of mass actions and possibility of influence (more or less) over the decisions taken by the city administration may appear very useful. Unfortunately, the life of this line was only extended until 25 December 2004. Site planning. The loop design happily allowed for preserving as many trees and bushes as possible. 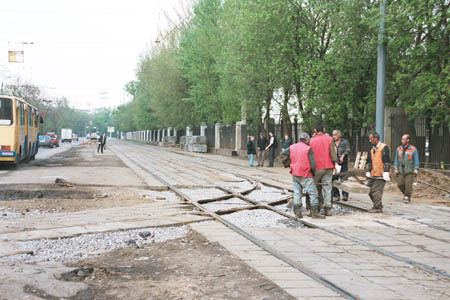 First tracks have been laid, crossing the road. New tracks join the existing line. 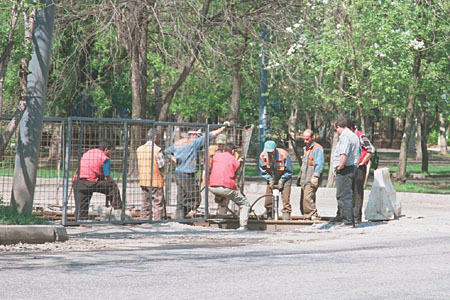 Workers are adjusting the turnout and crossover. There is also a yellow articulated bus unintentionally caught in the left part of the photo (note the yellow-white combined bus and trolleybus stop sign hanging above the bus). Less than a week after, most work have already been fulfilled. The tracks and sleepers are in place. 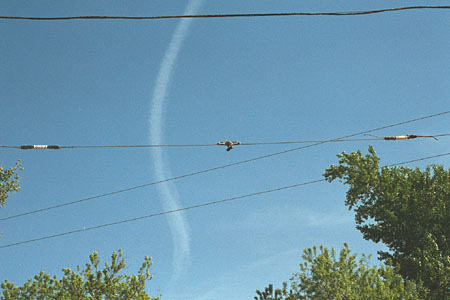 An overhead wire support. There is no wire itself yet, but all other elements are ready to accomodate it. Note white tubular ceramic insulators on both ends of the support cable.